In case you missed it, a while ago Google made a change to YouTube so that only Google Plus accounts would be allowed to comment on the site, thus stripping YouTube of its commentators’ anonymity. YouTube users were “a tad disappointed“, to say the least – yours truly included. 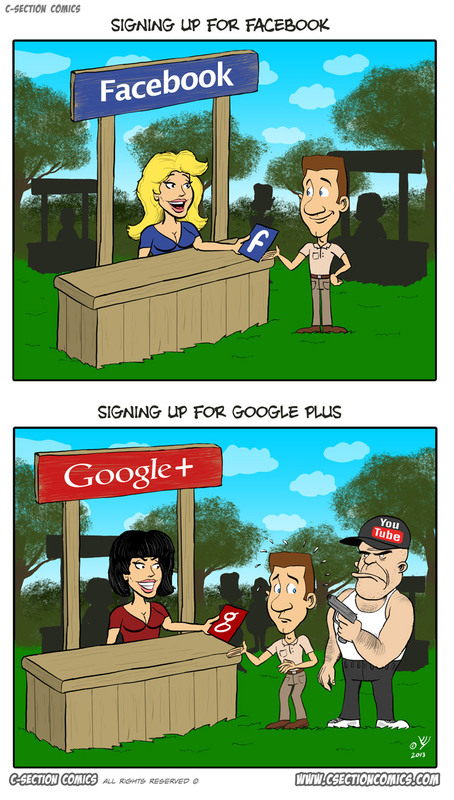 I actually like Google Plus. I’ve had a personal account there since its early days, and of course a page for C-Section Comics. I tend to enjoy Google Plus’s features and the content I get through the people I follow there. But forcing people to sign up for GPlus (either through YouTube or through opening a GMail account) so that Google can brag about the “millions of new users GPlus gets each month” isn’t a way to grow the GPlus brand. IMO it may actually achieve the opposite, as people would think “Wow, if Google goes all that trouble to FORCE people to sign up for its social network, it must be a lousy network” while, as stated, it’s actually a good network. Google, I seriously hope you reconsiders this YouTube policy change. And please stop pointing a gun to our heads – if a service is good, we’ll sign up for it. If it’s not, just make it better.